"It was only when I was close to dying that I received medical attention." My name is Norma Elva Gutierrez. I was born in Guanajuato, Mexico and I came to the U.S. in 1990 when I was 14 years old. My childhood was nice, but also sad and painful, as I was a victim of psychological and sexual abuse. My grandparents, who were supposed to take care of me, would hit me and mistreat me. My parents were not around to protect me so my cousin, who abused me, constantly threatened me to hurt my sister. So I didn’t speak out of fear. It is a fear that makes your blood cold, being close to your abuser. You speak up, but nobody believes you. They call you a liar. So I never spoke again. When I was 13 years old I was kidnapped and abused by a man who was much older than me. He took me by force and raped me. He abused me for weeks until I was able to escape. My son, now 28, was born after I was raped. My parents decided not to tell him he was my son out of shame because I had been raped. This shame is now the trauma that I carry, and that has led me to take many bad decisions. Now I don’t know how to live with the weight of my guilt. I feel guilt because of the wrongs I’ve done. I don’t know if everything has to do with the abuse I endured during my childhood. I’m ashamed of my past, but I’ve also learned a lot. We need to accept our mistakes and face them with courage and dignity. I have, or had, 5 children. Sadly, 10 years ago I lost my 18 month-old baby. Her death was so horrible that I have been in a bad state since. I have so much pain, frustration and shame that I have no courage to face myself in the mirror. When I arrived to this country, it was as if it was a different world, devoid of the evil and abused that I left in Mexico. But I was already used to stealing to deal with my anxiety and depression. I am a kleptomaniac; I’m not sure when it started, but I’ve been in therapy for years. Here in the U.S., I was also abused by my children’s father. Life hasn’t been easy for me, but I still want to move forward. On November 15, 2016 I was detained by ICE outside of my home. 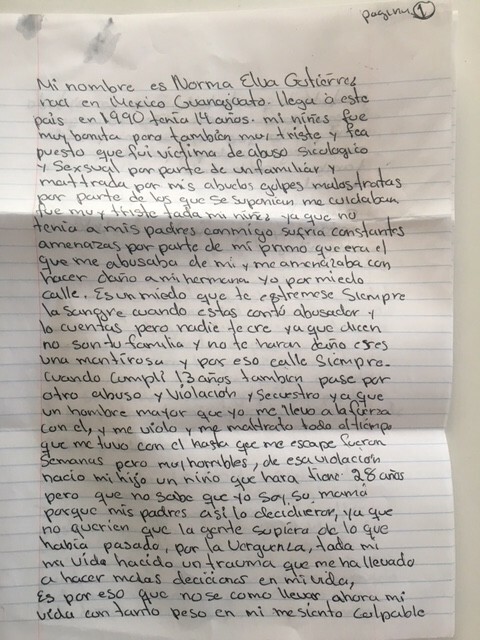 I was detained at GEO’s Adelanto Detention Center for a year. There I had a stroke; my face dropped on one side and I couldn’t move my right arm or leg. The first stroke was in January 2017, then I had another, and another. At first I was told that I was fine, that I was only nervous. It was only when I was close to dying that I received medical attention. My fight to stay in this country has been hard, but thanks to organizations such as CIVIC (now Freedom for Immigrants), I’ve been visited by people who support me and give me strength. That has helped me cope with being locked up and desperate. While detained I didn’t eat, I didn’t sleep, I only thought about my family and children outside. It is very hard and cannot be explained. Being detained and far from my family for a year has been the hardest thing I’ve ever endured. All the precious time was stolen for me, I’m never going to get back. It is something that leaves a mark on you. But I’m also a new and better person now. I received psychological help, so I felt confident when I had to go to court. I have a lot of faith in Ms. Sara Perez, my lawyer. Being in front of a judge and saying why you want to stay [in the U.S.] is hard; it is hard to express what has happened. Sharing your childhood traumas with people you don’t know is painful, because you have to remember. But it has to be faced with courage, so nothing can bring me down again. Being in front of a judge was hard, but it was good: for the first time I was strong enough to say everything I had inside of me. I still spoke with shame, but speaking the truth helped me come to terms with myself. My lawyer has helped me to have the courage to keep fighting, so I can stay with my children. I am afraid because I got out on bond. I have a terrible fear that if someone knocks at my door, or if there is an unfamiliar car outside of my home, that it’s ICE coming for me. That’s my worst fear. Living like this is no way to live. I’m also grateful because I’m with my children and family, the people I love. But it is very hard to be in constant touch with Immigration, as they have placed a shackle (ankle monitor) on me. I feel I’m confined within myself. I’m going to therapy every Tuesday and I take medications, which has helped me a lot. But living like this is no way to live. It is not OK to live confined within oneself. I won’t have peace until this is over. I trust God that everything will be OK. I have to keep fighting so I am not frustrated. For now, I try to live a normal life, which is impossible, but I still try. This is some of what I’ve lived. But I want you to know that I have the courage to keep going. I feel bad due to my past, but I am hopeful that it will remain in the past. And thank you Merilie Robertson, for being an angel in my life. May God bless you always.